Butoh acts as a radical challenge and catalyst for a deep and personal enquiry into the moving body. Butoh is not about doing movement but about being moved. Concentration is turned inward, away from the external mirror image of the body, to encourage a deep connection to the origin and impulses for movement. Participants are introduced to the value and power of working from imagination and from guided poetic imagery as tools for transformation. The body can discover many selves and extend into animal, plant or non-human entities. 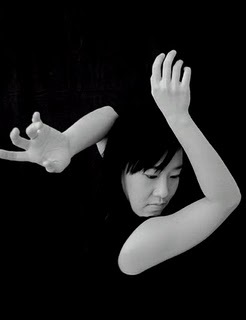 Each session begins with a short body training session incorporating Feldenkrais, voice and Butoh techniques that concentrates on wave, spiral and circular movement patterns allied to breath and voice. Butoh walks are taught as tools for realising the power of movement within stillness, silence and emptiness. Group and solo structures, improvised and choreographic allow participants time to explore the fluid interface between inner and outer space and to enjoy the delicious quality of slow motion work allied to working with dynamic energy and impulses.